So I recieved a press release of sorts from John in the UK regarding bicycle-related activity during the upcoming Climate Conference. It involves disobedience, protest and attempting to gain entry to areas where entry should not, technically, be gained. It involves bicycles. I like it. Put the Fun Between Your Legs, indeed. Read on. An irresistible new machine of resistance will be launched during the COP15 UN summit protests in Copenhagen. Made from hundreds of old bicycles and thousands of activists' bodies 'Put the fun between your legs: Operation Bike Bloc' is a collaboration between Climate Camp and art activist collective The Laboratory of Insurrectionary Imagination. Infamous for touring the UK recruiting a rebel clown army, running courses in post-capitalist culture, throwing snowballs at bankers and launching a rebel raft regatta, the Lab of ii’s creative visions will combine with the Climate Camp’s logistical genius, radical politics and capacity for mass mobilization to engineer an entirely new form of civil disobedience. Bike hackers, welders, activists, artists and engineers will team up to design the resistance machine in Bristol, UK. It will then be built and launched in Copenhagen as part of the Climate Justice Action mobilizations. The Bike Bloc will merge device of mass transportation and pedal powered resistance tool, post-capitalist bike gang and art bike carnival. We invite you to put the fun between your legs and become the bike bloc. If you want to help design and build the prototype come to the Arnolfini Gallery in Bristol between the 24th – 29th November. Or join us in Copenhagen, at the Candyfactory to build the final design and train up for the action (6th – 15th December). 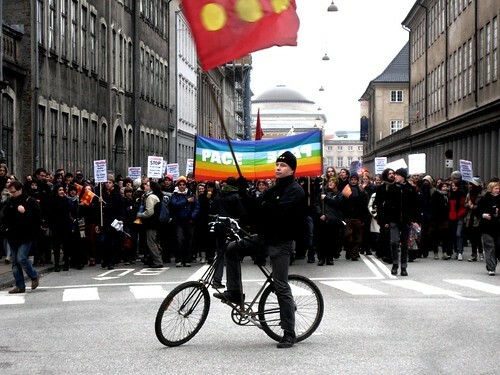 On the 16th of December the Bike Bloc will swarm through the streets of Copenhagen during the Reclaim Power action for climate justice. Here's a video about the project. The Danish activist group Modkraft is also reporting on this event on their website under the headline, "English climate activists will storm climate conference on bicycles". Which sounds a bit different than "swarming through the streets". :-) More interesting, too.